Men's Soccer vs. St. Mary's College -- Orange Out game! Men's Soccer tackles St. Mary's College in the first WCC home game. Get there early for the pre-game tailgate in the parking lot. 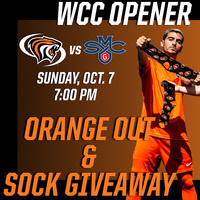 This will be an Orange Out game, and the first 100 fans dressed in orange will receive a free pair of Powercat socks!